The RYA First Aid at Sea course is a one day course (or 2 x evenings) available at our classroom at Waterloo Webber st SE18EN and Waterloo Road London 5 mins walk from the BR station. In a medical emergency a little First Aid knowledge and immediate action can save lives, especially in remote locations like out at sea. 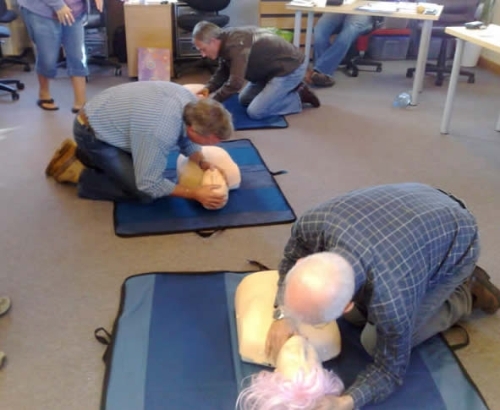 The First Aid at Sea course is one day course is designed to provide a working knowledge of First Aid for people using small craft and to support skippers of yachts and small craft working within 60nm of a safe haven. The course is MCA approved and the certificate is valid for 3 years. This is a must have for budding Coastal/Yachtmaster Skippers. However its a course that will provide skills that you may need at home or at work Something we should all know ! - Stroke / Heart attack. - We have some great video and use the very best equipment. It was a great to attend the first aid course earlier this week. I found the it very helpful and enjoyable, like the SRC course at the beginning of November. I will definitely recommend it to the other sailors at my club.